Where's the perfect spot to find St. Louis Ribs or sautéed sea scallops? Would you like to snare the recipes for the delectable eggplant parmesan at Chef's Restaurant or those scrumptious apple butterscotch scones at Asa Ransom House? Perhaps you're trying to find the ideal spot for a family dining experience or a business meal. 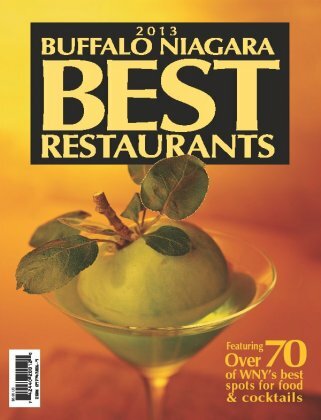 The 2013 edition of Buffalo Niagara's Best Restaurants is bigger than ever. The 178-page full-color guide showcases more than 70 of the region's best spots for food and cocktails. The guide, which still sells for only $6.95, serves up much more than profiles of restaurants. There are features on healthy restaurant options for kids, the hottest restaurant trends and tips for using the Internet when dining out. If wine is your thing, there's an information-packed article about winding through wine country. There is even a guide that pinpoints eating spots that offer gluten-free delicacies. Order copies today by e-mailing us at: buffalobooks@att.net or by calling (716) 832-6088.